Flue gas analysis at combustion plants fired with solid fuel types – no problem at all with the suitable filtering technique. Combustion plants firing solid fuels are getting more and more popular. New processes (e.g. Pellets heating) and improved burn-out features led in the past years to a market increase in the solid fuels combustion business. Despite of all improvements provided by the burning systems, the flue gases still contain a large number of substances harmful to the electrochemical cells of flue gas analysers. Problematic in this context are above all: the increased dust contamination and organic compounds. 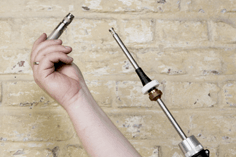 Relatively simple and reasonable solutions provide flue gas analysers with an effective protection against such substances. The dusty flue gas is pre-filtered and its surface is enlarged by bubble formation. In the water bath, the sensor-damaging organic compounds are separated while the gas cooler dries out the measurement gas. Appreciable side effect: the 5°C gas drying increases substantially the lifespan of the sensors. 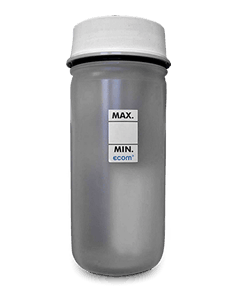 Gas cooler and gas washing bottle are available for the models of the product ranges ecom-EN3 and ecom-J2KN. With integral filter for pre-filtering of dusty sample gas, enlargment of flue gas surface thru bubble formation and dilution of sensor-damaging organic compounds. Tubing length: approx. 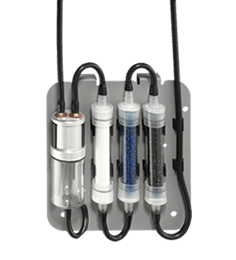 1 m.
– hydrocarbon filter for removal of sensor-damaging organic compounds. The filtering case either consists of water trap, fine dust filter, drying and hydrocarbon filter cartridge. Compared to the filtering plate, it is designed to process a higher volume of condensate as well as of gas components. The heated sampling system enables the measurement of water-soluble substances like NO2 and SO2 without washing-out effects. A hot gas filter integrated in the heated head protects the analyser against especially by longer measurements against premature soiling. The maximal gas temperature allowed amounts 500 °C. 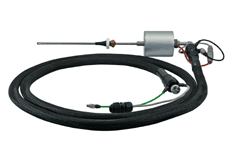 The probe pre-filter fits on all SB/SU and SCD probes (diameter 8 mm and 10 mm). 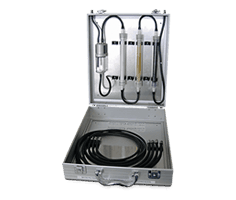 It is recommended as a protection of the analyser when measurements are to be performed at exhaust gases with heavy dust or soot concentrations (e.g. wood or heavy oil combustion). The maximal operation temperature amounts 500 °C. Water-soluble gases like NO2 and SO2 are not influenced by the probe pre-filter – unlike temperature and draught measurements which may show minor drifts.